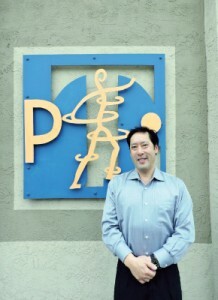 ALLEN LING, PT, OCS, CEO, IS THE OWNER OF PHYSICAL THERAPY INNOVATIONS, INC., WITH FOUR LOCATIONS IN CALIFORNIA. HE CAN BE REACHED ATALLENLLING61@GMAIL.COM. Practice, Location: Physical Therapy Innovations, Inc., has locations in El Cerrito, Albany, Orinda, and Oakland, California, employs 33 staff, and has been in operation for 25 years. What is the most influential book/person/event that enhanced your professional career and brief description of why? My parents are the biggest influence, and I want them to be proud of me. I was not the smartest son, but I worked hard and got things done. I also worked at Pixar Animation Studios for Steve Jobs as an onsite physical therapist and that influenced me to become the best—and even better. My student physical therapists teach me how to enjoy patient care. I love their energy and enthusiasm. One student—Aaron Lebauer—is now a successful private practice cash-based physical therapist. He still amazes me, and I like his balanced lifestyle and practice philosophy. Describe the flow of your average day. Last year I started treating part-time about three days a week and spend the rest of the time coaching staff and students, doing business-related duties, and trying to envision the future of our profession through networking and brainstorming with the smartest folks I know in the industry. I now work on my business and in my business. Describe your essential business philosophy. It is important to be kind and fair to patients and employees. They are all my partners in their health and in my business. However, if they break the rules and do not behave properly, I should not have to suffer for their mistakes. What are some of your best, worst, and toughest decisions? It is always tough to ask employees to resign or to terminate them for performance issues. And sometimes those are the best and toughest decisions. Also, using legal means to get money back from insurance companies that owe me money can be tough—it is like biting the hand that feeds you. The best decision that I ever made was to buy my own buildings for my clinics. How do you motivate your employees? I offer fair and generous pay and benefits, a kind and reassuring word, and even a heartfelt hug when we both need it. I have a great family atmosphere, and I am very loyal to my staff. How did you get your start in private practice? I do not know how to fail or quit. I worked 80- to 100-hour weeks for the first five years of my career in nursing homes and at my private practice, and then 70 hours a week for the next 10 years just doing my private practice, and then 60 hours a week for the next 10 years after that. Now I am at a 40-hour week. Anyone who wants to be successful in starting a business needs to put in the effort. How do you stay ahead of the competition? I stay ahead by not competing but being collegial and collaborative. We all want to be successful but have different locations and different preferences. I have chosen to not move in on the territories of other private clinics simply because I would not want them to do that to me. Mutual respect keeps me in business. What have been your best learning experiences since the inception of your practice? Expanding beyond one clinic is the hardest thing to do, and it is easy to overextend yourself. I make far less with four locations than I did with two. Now that I have done it, I am happy to have survived the expansion and am reaping the benefits with local Accountable Care Organizations. Many local clinics that did not expand are having trouble making it now. What are the benefits of PPS membership to your practice? Knowing there are others like me out there. What is your life’s motto? Live life to its fullest at work and at play. Work can be fun but always take it seriously. And even fun can be work! What worries you about the future of private practice/what you are optimistic about? Private practice is brutal in California, and you have to be tough to be successful. I have seen clinics come and go in the past 25 years and very few open and stay open. One desperate decision can lead to the eventual demise of any practice in my geographic area. I am optimistic about some of the new doctors of physical therapy coming into practice and that their intelligence and their use of technology to communicate the worth of physical therapy services will prevail. What are new opportunities you plan to pursue in the next year? I would like to regain the reputation our clinic had when we were just one location. It takes time to focus on the things that matter most: the overall patient experience and the happiness of employees working at my clinics. We just built a martial arts studio that adjoins our Oakland physical therapy clinic. It is the first of its kind to combine martial arts–based rehabilitation with physical therapy in such a big way. Is there anything you would like to share with other PPS members that we missed?There are no competitors, only colleagues. The minute I became friendly with other physical therapists near or far, the world became a better place for me. The worst enemy is ourselves, so better to spend your energy improving yourself versus fretting over what other people are doing.